In January 2013, we visited Tucson Arizona. On our final day, we headed out to try to find Ruby, AZ, a ghost town we’d seen references to on the radio. It was a true adventure as we had a vague idea of its location on the Mexican border. Stopping in to ask here and there, we finally made the drive across 6 miles of passable dirt roads through cattle country to this former mining town. A caretaker collected a small fee, had us sign releases, and warned us about rattlesnakes. It was pretty cool to explore the crumbling buildings and drop a penny down the mineshaft. It was one of our better adventures. This entry was posted in challenges and tagged ghost town, mining, postaday, ruby, weekly challenge on February 28, 2014 by milfordstreet. Captain America, a photo by Christopher OKeefe on Flickr. 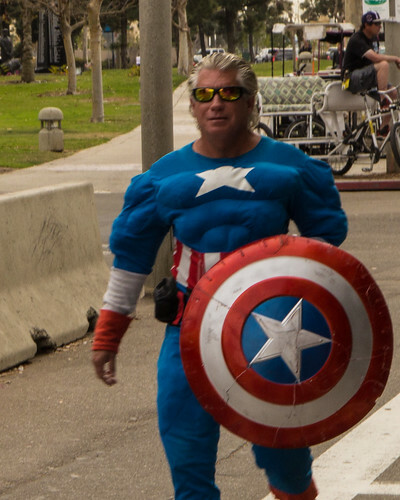 Surreal is walking along the waterfront in San Dieego and spotting Captain America. This entry was posted in challenges, Daily Prompt and tagged america, captain america, daily prompt, postaday, surreal on February 28, 2014 by milfordstreet. 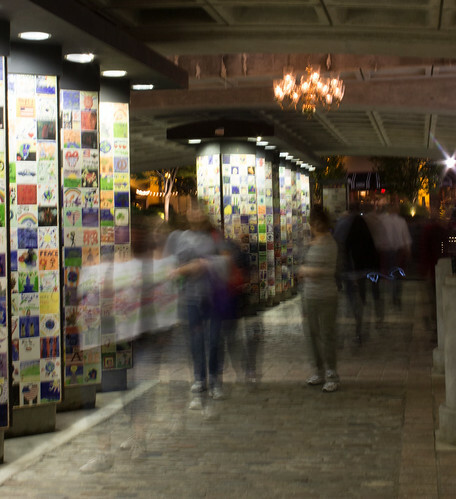 Providence Ghosts, a photo by Christopher OKeefe on Flickr. This entry was posted in challenges, Daily Prompt and tagged daily post, movement, postaday on February 27, 2014 by milfordstreet. 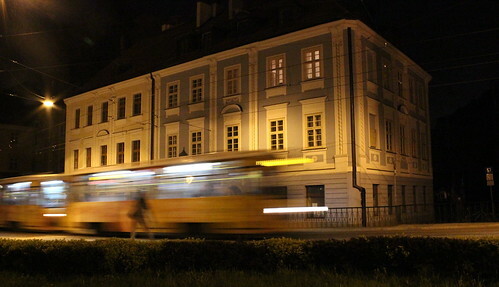 Night Tram – Wroclaw Poland, a photo by Christopher OKeefe on Flickr. Did this tram really pass or did I just dream it? This entry was posted in challenges, Daily Prompt and tagged daily prompt, dream, imaginary, postaday, tram, Wrocław on February 26, 2014 by milfordstreet. West African Highlife Band 2, a photo by Christopher OKeefe on Flickr. 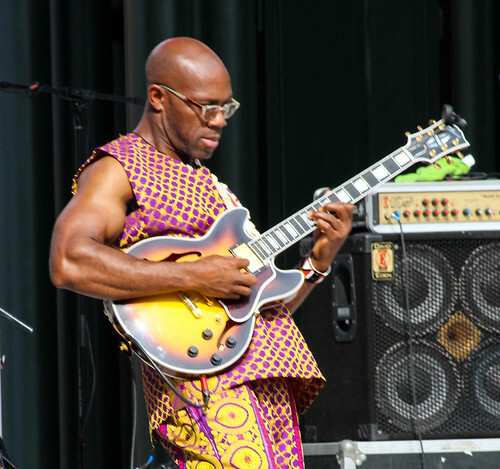 A member of the West African Highlife Band at the Lowell Folk Festival last summer. This entry was posted in challenges, Daily Prompt and tagged daily prompt, guitar, performance, postaday on February 25, 2014 by milfordstreet. I’ve posted several set of photos of the architecture and sites of San Diego. This gallery is the last set. The photos are not from a single place but represent the small details that I found in those places. Often it is the small things that give a place character. This entry was posted in san diego, travel and tagged details, gaslamp, old town, san diego, travel on February 24, 2014 by milfordstreet. Hiking on the Skaftafell Glacier, a photo by Christopher OKeefe on Flickr. 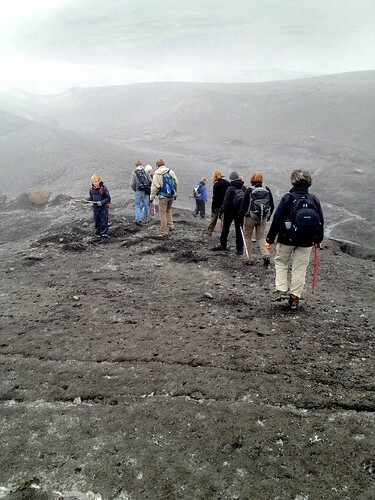 Hiking on the Skaftafell Glacier felt a bit like walking on the moon but with some well applied crampons, no legs were broken. This entry was posted in challenges, Daily Prompt and tagged daily prompt, glacier, iceland, postaday, risk on February 23, 2014 by milfordstreet.